With annual production of 50,000 tractors, TürkTraktör is the largest producer of tractors in Turkey. The powertrains of the company’s tractors contain many gear pairs and gear groups that transmit torque through the system. 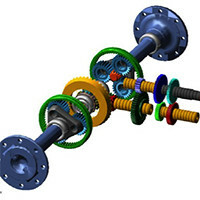 For example, the transmission group includes spur and helical gear pairs. Next the torque is transmitted to the differential via a hypoid gear pair. After the differential, a planetary gear group reduces the torque. The torque is transmitted through shafts between gear pairs and most of the shafts are fastened with multiple bearings to the chassis.